1. You’ve learned how to amuse yourself while the rest of the barkada talks about their newest K-Drama favorite. Since hindi ka maka-relate, might as well just up your Everwing skills while in the middle of dinner, right? 2. You’re the only one who shows up on time for brunch dates with your friends. 3. You’ve seen how much your friends have lost themselves in K-Beauty, and you're pretty much sold on it, too. OMG, they ALL have cute bangs and flat brows na! Although you might not be as committed as they are, you do love the sheet masks and lip tints! 4. Every day, you get messages from your friends ~*begging*~ you to just take the leap and start with Goblin. 5. 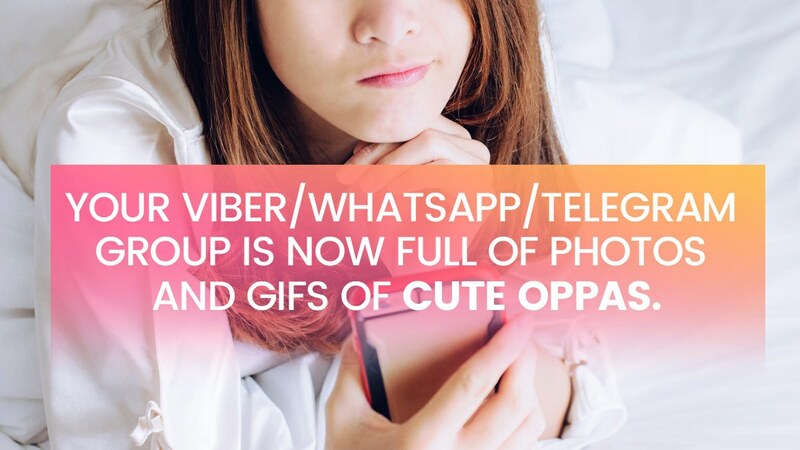 Your Viber/Whatsapp/Telegram group is now full of photos and GIFs of cute oppas. You’re not sure who’s who, but you have to admit, they’re all good looking! 6. You’re always quiet in your barkada’s group chat because you have no clue who/what they’re talking/freaking out about! Like that day the Song-Song couple suddenly announced their engagement. You literally had to put the group on mute. Kalma, guys! 7. You’ve been left to have dinner on your own because all your friends just want to go home and finish shows. 8. But when they DO agree to go out with you, it’s almost always to eat at a K-bbq restaurant and you have ZERO complaints about that! 9. When your friends start to re-enact a scene from the series they’re currently watching, you just sit there, stunned. Ano nangyayari, guys. Are YOU speaking in Korean?! 10. You weren’t planning on it, but now you’re set to go on a barkada trip to South Korea. 11. You realize that there is no escaping it, because even E! has been completely consumed by K-fever. Remember that time after watching the Keeping Up With The Kardashians and then SNL Korea suddenly aired? Wait—what?! 12. You secretly judge your friends for wearing turtlenecks and layers in this tropical country. Or that time your friend wore a red scarf to dinner and you wouldn't let her hear the last of it! LOL! Love you still, girl! 13. You've definitely rolled your eyes when your friends start to talk about their K-drama obsession, but you realize, hey, at least you still have great friends! Kahit kinain na sila ng sistema.